Before learning how to play an acoustic guitar, it is beneficial for a beginner acoustic guitar player to learn the part of a guitar. In the event that you ever take lessons or talk to other players, you will be able to communicate and learn more appropriately. The Acoustic Guitar, 3 Regions, Many Parts! 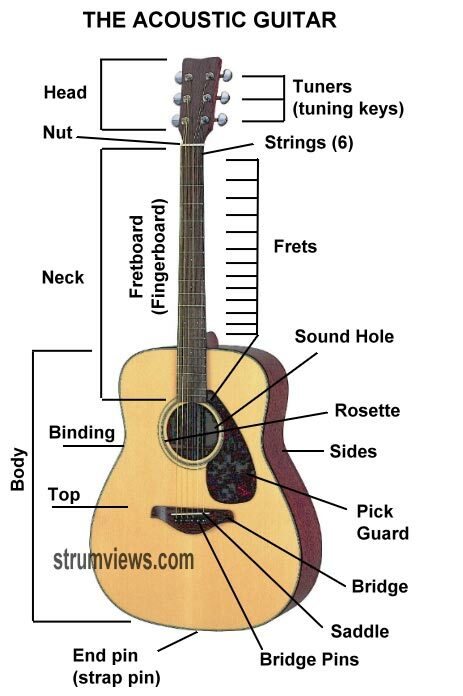 The Acoustic guitar anatomy or layout is essentially the same for the beginner and the advanced player alike. It’s true that a more advanced player may use more of the fretboard, but the parts that comprise a guitar are universal. The Head Region or Headstock is where the “tuning” of the strings takes place. One end of each of the 6 strings (on a 6 string guitar) is wound about the machine head which in turn is geared by the tuning keys or tuners. If you tighten the string, it will increase the pitch or frequency of the string (making the note higher), and if you loosen the string with the tuners, it will decrease the pitch or frequency when the string is strummed, picked or plucked. At the bottom of the head (and arguably the top of the neck) is a block of plastic or other hard material called the nut. The nut keeps the strings equally spaced at the head / neck end and allows the strings to vibrate freely when open or not chorded. The Neck Region is where a lot of the action takes place. For many players, this is where the fingers of the chording hand press the strings into the frets to shorten the “nut” end of the string, thereby giving the string a different pitch. For the right handed player, the left hand fingers are used for chording and for the left-handed player, the right hand is the chording hand. There are two ways to change the pitch of a string essentially: by changing the tension (tightening or loosening ~ or in more advanced studies, by bending it) or by changing the length of the string. The purpose of the fretboard (and the bars between the frets) is to create a temporary “endpoint” other than the “nut”, thereby changing the length of the string and increasing it’s pitch or frequency. On top of the neck surface is the actual fretboard as discussed in the previous paragraph. Chording can take place virtually anywhere on this fretboard, but must follow some specifics to get an actual musical chord. The fretboard extends to the body, beyond the neck and heel of the guitar, ending at the sound hole. On the fretboard are several dots that are specifically placed there as references. Those dots mark specific frets for quick reference for the beginner or advanced guitar player. They are not as important for a brand new player, but will prove more helpful when one learns to play bar chords and more advanced scales and improvisations. The Body Region is where a lot of other magic happens. The basis of the body of the guitar is to amplify the sound of the strings in an acoustic guitar, as well as provide a decent amount of placement for holding the guitar and the other end of the strings. Guitars belong to a class of instruments called chordophones (in the same family as banjos, pianos and dulcimers) and their most universal identifying characteristic is that they create sound when a string that is taut between two point is caused to vibrate. The strings are taut over the saddle and are anchored by pins through holes that are housed in the bridge. The saddle is essential such that without it, the vibration of the strings would not transfer to the body very well for amplification. When the strings are strummed on an acoustic guitar, the vibration is focused chiefly to the top (surface) of the guitar body, as the rest of the body causes amplification and projection through the sound hole. The pick guard serves as protection to the finish and the wood top of the body while a player strums over the lifetime of the guitar. The rosette serves as a form of decoration and strength to the sound hole, as the top is usually made from 2 mirrored, jointed pieces of Sitka Spruce or Englemann Spruce wood on most decent acoustic guitars. The bindings also decorate the edges of the guitar, but serve as protection for the corners and are usually made from a synthetic polymer or mother of pearl (and other precious materials) in more ornate guitars. The bottom of the guitar usually has an “end pin” for a guitar strap end, and in acoustic electric guitars, this end pin serves a dual purpose as a stereo output for amplification. About the Author: Aaron Schulman has been a musician since 1984 and an avid guitar player since 1990. You can read more about acoustic guitar reviews before making an investment to ensure you find the best beginner acoustic guitar for your money at StrumViews.com.